One of the most loved wedding themes of all time is Vintage. Capturing the glamorous charm of the 20’s and the free spirited loving vibe of the 70’s, what’s not to love? The main attributes of Vintage revolve around lace, details and almost that old fashioned traditional feel. It all begins with an invite, and what a complicated world the invitation world can be! Wedding stationery is so much more than a glossy bit of paper stating when your wedding is. It’s the first impression of your big day. 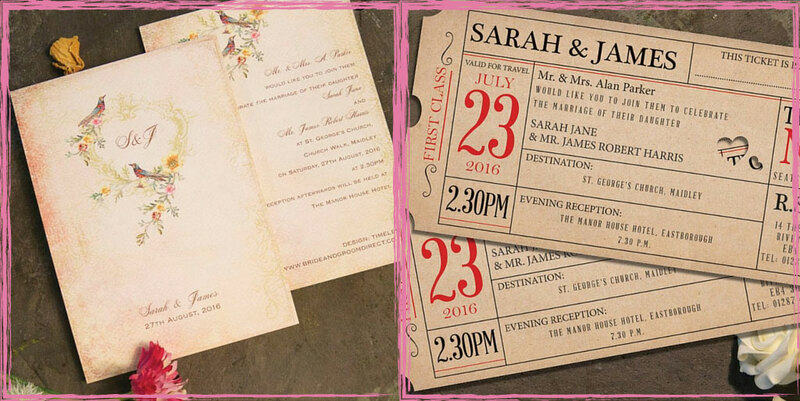 Choosing a Vintage style invitation will give your wedding a timeless sophisticated feel. And provide your guests with a hint of what’s to come. Take a look at the huge range of wedding invitations. Neutral colours like ivory and beige really suit the Vintage scope, or if you’re wanting to focus more on the rustic elements of the Vintage theme why not add a bit of colour or floral designs to give your invitations that extra bit of detail. With 101 things to consider and plan wedding favours can sometimes feel like an added stress. Wedding favours can be a tricky tradition to get right- finding something which suits your guests, your theme, and your purse can feel like you’re searching for the impossible. Mason Jars are crazy popular in the world of weddings – not only can they be used for almost anything, they are also adorable. These Mini Glass Jars can be filled with anything from hot chocolate powder and cookie mix to sugar bath scrubs, giving your guests a classic and elegant memento to take home with them, whilst fitting in with your theme and bank balance! If you want to avoid the Mason Jar craze and opt for something a little different making your wedding unique, why not have a look at some alternative accessories. 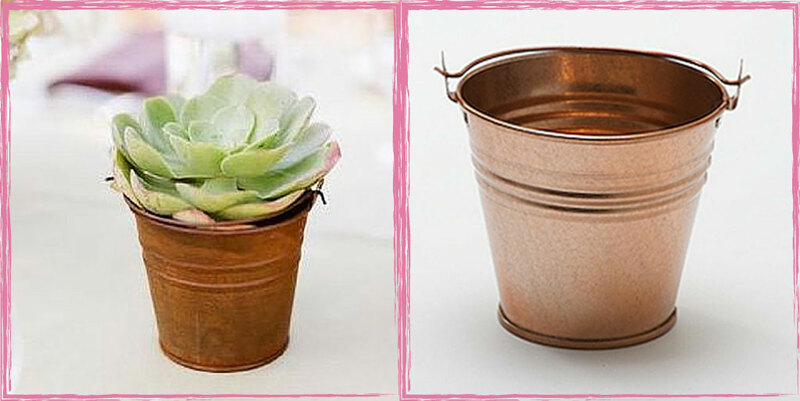 These buckets are great for Rustic and Vintage weddings, adding a hint of Shabby Chic to your big day. Fill with penny sweets and old school goodies for your guests to take away. Or pop in a candle or some plants to add to the Vintage ambiance at your dinner table! If you’re not the DIY type then why not send your guests off with a bag full of tasty treats! These Striped Bags are ideal for a Vintage themed wedding bringing an old yet new feel to your day, simply fill them with some confectionery and the job is done. 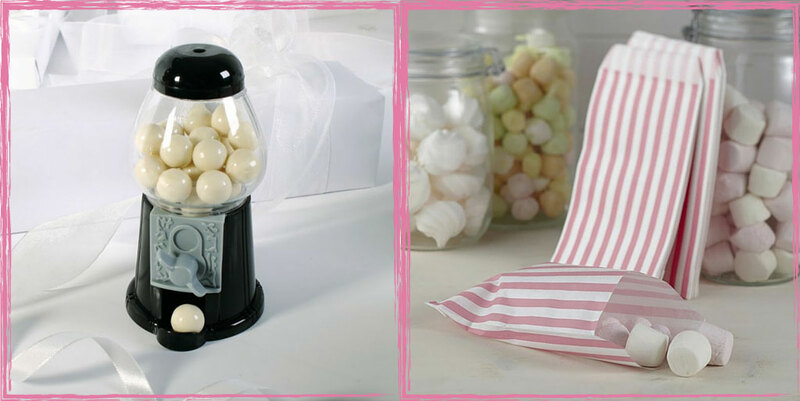 Vintage may not seem like the most child friendly theme, but these retro Gumball Machines will provide lots of fun for the children and could turn out to be the perfect favour. The main thing is- your accessories should match and reflect your theme. Chalkboard Place Cards and Hessian Table Numbers which can be tied around bottles or table centrepieces are just two of our favourite accessories to keep up with the Vintage vibe! Centrepieces are a lovely idea bringing a decorative touch to your wedding. 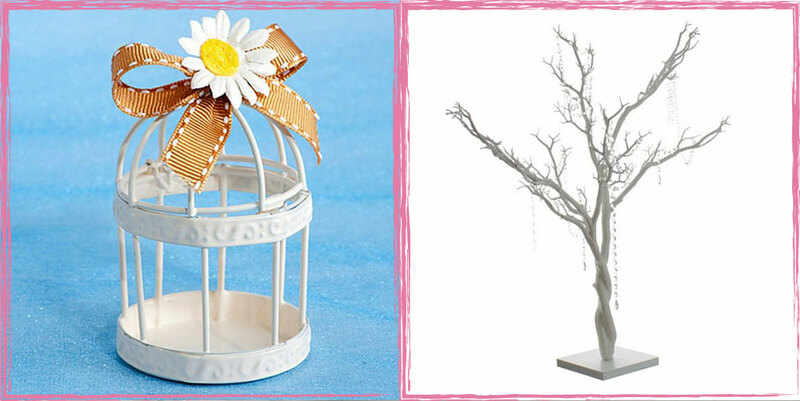 One of our favourites is the stunning Birdcage – it’s perfect as you can decorate it as you want. Whether it’s flowers, pearls or candles they truly are an elegant piece to be the focus of your table. 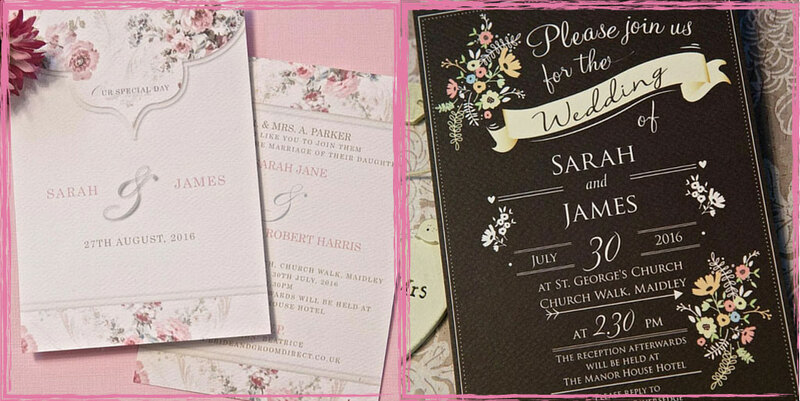 To check out our full Vintage Invite Range click here!